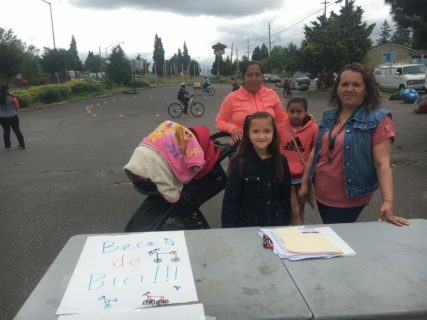 On May 20th, Andando en Bicicletas en Cully (ABC), Community Cycling Center, Bikes for Humanity, and The Street Trust came together for Beca de Bici 2017, a bicycle giveaway for children in the Cully neighborhood. Patty Otero, our Program Coordinator, shared a recap about the event. How did the bike giveaway come about? This was the first Bike Buddies event in Cully, but Bikes for Humanity has brought the program to other parts of Portland since 2015. We all worked together to create a system for registering kids. ABC was interested in inviting families who had not participated with their events and activities before to register. One of the criteria for getting a bike was the ability for Cully families to secure their bikes inside, which is a known issue in the area (for more about this, please check out Understanding Barriers to Bicycling: http://www.communitycyclingcenter.org/community/partner-programs/understanding-barriers/). Members went door to door and approached families they had never approached before. Participation was open to any family who had participated in the in-school bike safety program and had a secure place to store a new bike. Where and when was the bike giveaway? On Saturday, May 20th we had the Beca de Bici event at Living Cully Plaza. It was really fun! We gave bikes to 22 4th-6th graders. All were from Spanish-speaking families. What was one of your favorite moments? It was nice when the event was moving that we had a station system. ABC, Bikes for Humanity, The Street Trust, and Community Cycling Center members were at all the stations, starting with registration. Families moved through the stations throughout the event with no real hiccups. Participants got a bike helmet, safety information, the ability to pick their own bike, a test ride with their new bicycle in the rodeo, and then a bell, a sticker, and a u-lock. Each recipient got a graduation photo, too! One family donated a very worn bike that was obviously well-used and then basically traded it in for a tuned up slightly larger bike that was otherwise the same. It was exciting to see how bike giveaways can be cyclical, that a family can bring in a bike when a child has outgrown it. One student couldn’t make it to the event on Saturday because they were going out of town to celebrate their birthday. When we staged the bikes at Living Cully Plaza to get ready for the event, we went to that student’s house and dropped their bike off with a helmet and lock. It was a fun birthday surprise! What would you hope for this event in future? 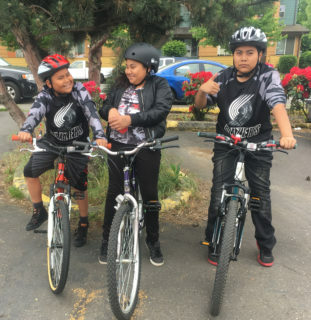 We would like to do another bike giveaway in Cully and do them more frequently, which would allow participants to get into the habit of trading in outgrown bicycles for new ones to continue kids’ bike use. It would be great to continue to do Beca de Bici with ABC and Bikes for Humanity in Cully as an annual event! I really enjoyed seeing English-speaking Bikes for Humanity volunteers working side-by-side with ABC members, smiling, engaging, and translating using what they knew of the others’ languages, and with the help of the bilingual children. We have run 5 events now–two east of 205, one in Foster Powell, another in St. Johns, and this one in Cully–but this was easily my favorite. ABC’s work to connect these bikes with members of the community deepened the connection already established by William Francis in the schools. The bikes and the safety education are the simplest pieces of the program, but the legwork done by ABC members to find out which kids would enthusiastically benefit from the bikes was the extra step to make the event truly successful. That this included bringing a bike, helmet, bell, and lock to a student’s front door days before her birthday like the publisher’s clearing house bringing a cartoonishly large check was especially magical, and more memorable than anything in my almost three years working with Bikes for Humanity. Inspired to ride? Join ABC, Community Cycling Center, and The Street Trust this Saturday, June 3rd, for a Learn to Ride Workshop for Adults.